In final days as @CamdenSchools superintendent, @Rouhanifard talks 5 years of improvements in student achievement and school safety. When Paymon Rouhanifard took over as superintendent of Camden City School District in 2013, 23 of the city’s 26 traditional public schools were performing among the state’s bottom 5 percent. The number of failing schools has since fallen to eight out of 18, “which speaks to the fact that we’ve gotten smaller but better over time,” Rouhanifard says. Camden, one of New Jersey’s poorest school districts, has been on the rise under Rouhanifard’s leadership. About 95 percent of Camden students qualify for free or reduced-price breakfast and lunch. Some also receive dinner. Through a combination of social-emotional supports and portfolio-driven reforms, student achievement and safety have dramatically improved. Five years into this new model, student performance and graduation rates have surged. The dropout rate has been cut in half, and math and literacy scores have more than doubled over the past two years. More than half of the district’s students are now in charter schools. Only New Orleans, which was re-created as a nearly all-charter district after Hurricane Katrina, has a higher proportion of students in charters. Still, Rouhanifard is the first to admit that Camden continues to have a long way to go. Just 11.4 percent of students are proficient in math and 15.7 percent are proficient in English. The average statewide rate is 50 percent in both categories. So although the achievement and opportunity gaps are closing, there is still work to do. Next Friday marks Rouhanifard’s last day as Camden City School District’s superintendent. His successor has yet to be announced. 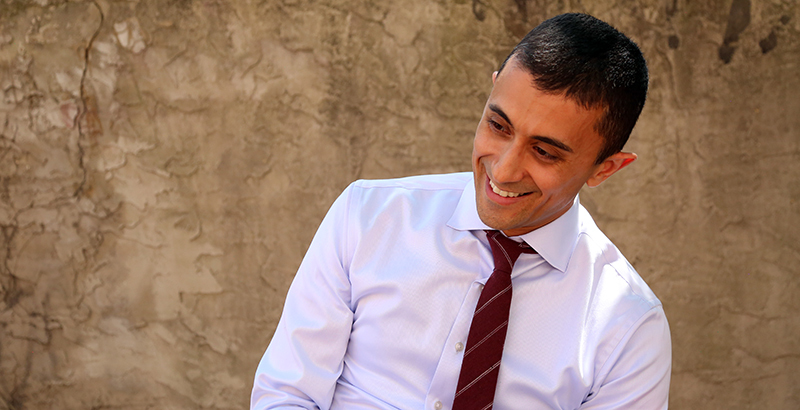 As the school year comes to a close, The 74 sat down with Rouhanifard to talk about his five years leading the district and his outlook on Camden’s future. This conversation has been lightly edited for length and clarity. The 74: Tell us about your biggest accomplishment since you’ve been here. Rouhanifard: I’d say the accomplishment I’m most proud of is the fact that we’ve been able to build large coalitions of support to do really hard work that isn’t always popular. But we were able to get the buy-in of large swaths of our community from elected officials to current leaders to do what’s right for kids. What was your most persuasive argument when it came to building those coalitions? What do you think resonated the most with families and politicians? I’d say two things. One, the case for change here was fairly clear-cut. Most parents could have made it for you. They were looking for change. Our elected officials were looking for change. I think, too, when we came here, we didn’t come assuming we had all the answers. I think people appreciated that. I think people appreciated they were at the table, and we were just listening and didn’t have a prescription that we were applying. What are some of the answers that you think you found along the way here? It’s an important question, and one I think I’m still grappling with, as all of us are in this work. I think it probably goes without saying that there are no cure-alls. There’s no single solution to this work. I think what has benefited us is an acknowledgement that the challenges we inherited are decades in the making, rooted in poverty, which is born out of centuries of injustice. I think when you frame it that way, people understand it’s not going to change overnight. What I really believe has put us in a position to see sustained improvement over time is that we’ve taken politics out of the classroom and we’ve just tried to focus decisions on kids. Part of that is through partnering with nonprofit organizations that can focus their decisions on kids. Part of it is just getting our community and elected officials to come to that realization that we need to play the long game here. This isn’t about, “How do you create the greatest lesson plan?” But this is about really meeting our families where they are. Here in Camden, it’s about wraparound support services. It’s about mental health clinics. It’s about trauma-informed care. That doesn’t necessarily lead to having “test score gains” overnight, but you’re absolutely doing what’s right by our community. One of the first things that you talked about when you started here was school safety, and you implemented a pretty ambitious plan in partnership with the police department and other nonprofits. Tell us about the evolution of that school safety work from day one to now. We’re just really proud that we’ve had an amazing relationship with the Camden County Police Department. Chief John Scott Thomson is a big believer in the approach that we’ve taken, meaning a restorative approach. Their community policing very much resonated with the work that we were doing, and so it was a natural partnership from the very beginning. They’ve just always been a phone call away. Safe Corridors is the program that you’re referring to. Our partnership with the police department allowed us through the high-density passageways in the morning and afternoon to make sure that there were police officers there. Not just of policing and being present for the sake of being present, but also doing it in partnership with neighborhood groups as well. You’re a former teacher. As a superintendent, how did you keep in touch with educators and have your finger on the pulse of what was going on in your district? I think more than anything else, as opposed to approaching this as some sort of technocratic leader who was running professional development sessions, I just told myself, “This is a lot more fun.” I would just be out in the community and humanize the work and just get to know people and try to better understand the needs that way. It’s been a blast. We have teacher roundtables, student roundtables — I try to make it to various community events and athletic events, performing arts shows. I learned a lot from our community, and I could point to some of our biggest initiatives in terms of trying to improve outcomes for kids as byproducts of just conversations I’ve had with local groups. How do we cultivate and incentivize more districts to learn from Camden’s successes? We shouldn’t replicate for the sake of replication. A lot of people have said really nice things about the work here. First thing I’ll say is, we have a really, really long way to go, and that’s putting it lightly. Again, that speaks to the scope and complexity of the challenges we inherited. No two municipalities are the same. We had a confluence of circumstances here from legislation and political support that may or may not exist in other places. I’m a big believer that you do have to compromise and you do have to meet people where they are. I know it can also be understood to be true that we should just stand tall and take on every fight imaginable, but there’s a limit to that approach and to that mentality. So yeah, what we were able to do here may or may not be relevant to the next municipality. I’m certainly happy to speak to anyone about our work, and we’ve learned a lot from other district leaders as well. What are two or three priorities on the docket for the next two or three years that you hope will come to fruition? I would say one, we want this to be a smooth transition, and we’re working with the governor’s office and our mayor, our school board, and many others to ensure that there is continuity and stability. When I came in, I was the 13th superintendent in 16 years, and that was just as much a root-cause problem as the decades of challenges rooted in poverty born out of centuries of injustice. You think about the fact that everybody came in here with this mindset of, they want to do better, but every one or two years, we would flip the script and try something different. That created turmoil and instability that really, truly, most tragically affects kids. So we just want to make sure that we can ensure stability. For us specifically, it’s that our deputy superintendent, Katrina McCombs, is hopefully the next superintendent. That’s not my choice to make, but we’re hoping she’s the person chosen by the governor. Two, we want to maintain our partnerships across all school types, because we have three different school types here in Camden. It’s not a traditional education ecosystem, and so we want to make sure that everyone is working collaboratively like we have been. I think with the right leader, that can certainly be accomplished, but there’s still a lot of intentionality that goes into maintaining our Camden enrollment program, ensuring that we’re all trading notes and working collaboratively to share best ideas and practices and so forth. There’s a lot of work to be done there. Can you characterize Camden’s academic progress with some data? Our proficiency rates have nearly tripled in both [English language arts] and math, but that’s in large part because we started at the low single digits: 4 percent and 7 percent in math and ELA, respectively. Our dropout rate has gone from 22 percent to 11 percent. I think you can say a lot of different things about test scores and gaming the system or whatnot, which I’m always happy to have that conversation, but the fact that more kids are staying in school shows that we changed the culture and climate of our school buildings, and our teachers and principals get all the credit in the world for that. We’ve revitalized the city. Half of our buildings were constructed before 1928. When I came in, it was truly in disrepair. I’m talking no capital dollars over the course of decades invested in some of our buildings. Just like sweeping floors and changing lightbulbs, that’s all that was done. No roofs were repaired. No boilers replaced. Now we’ve got $336 million … across 11 different projects in the city, including a $133 million project for Camden High School, which is really like a landmark institution here. By every way you cut it and measure it, we’re better today than we were five years ago. Tell us about coaching hoops and why that was important for you to do and what you learned as a coach. Coaching was a totally selfish move. I just wanted to be close to our kids, because I really enjoy that. I had to negotiate that for two years with my wife, because I’m already not home enough as it is. I already had a lot of respect and admiration for our volunteer coaches. They get a tiny stipend. But I grew even more respect for what they do, having done it. It’s a massive time commitment, but it reminded me of why we’re all doing this work, just to be with our kids each and every day. It was just a blast. Coaching is just teaching in a different format. It was just really amazing to spend time with our amazing coaching staff. Every practice was like a lesson plan. They were scripted, and we thought about what we wanted to do, what buttons to push. There’s a social-emotional side to coaching. It was honestly the best part of my five years here. It was really special. Coaching is really hard, just like teaching is really hard. You can put your all into it, and on some days, you think you’re going backwards, and then on other days, you realize that that one kid that you’ve been trying to help become a better leader on the court all of a sudden is demonstrating maturity in a way that you didn’t think was possible. It’s like banging your head against the wall, because it’s so hard one day and then seeing the fruits of your labor the next. Having worked in a couple of different districts as both teacher and administrator, how do you feel looking across the country right now about the state of change? I’m optimistic when I think about our children here in Camden and children I meet anywhere. I really believe that the hallmark of effective leaders and individual contributors in organizations is someone who actively seeks to disconfirm what they most believe to be true, as opposed to solely affirming what they most believe to be true. It’s easier said than done. I’m by no means perfect on that, but I think it’s necessary, and I think there’s a third way to do this work. It’s not just about charters. It’s not just about testing. What would you say is most misunderstood about Camden? It depends on the audience. I’d say what is most misunderstood about Camden from the reform community is that we implemented a so-called portfolio model that’s about accountability, which it isn’t. As far as the rest of the country, I think there’s a lot I could speak to in terms of misperceptions of urban environments and the ability of our kids. I have personally come to believe that we have put too much of an emphasis on testing. Part of that is the short-term results we seek when the challenges are so long-term in nature. I think tests tell you a lot of things, but I think when we just look at a portfolio model that looks to evaluate schools in simple outcome buckets, it doesn’t nearly capture the complexity of a school. Two, it doesn’t really speak to what’s happening long-term in that school building. So we actually did away with our school evaluation cards about a year ago. We put into motion a plan that changed the landscape of schools by partnering with nonprofit organizations to provide better outcomes for kids. I think that short-term focus has a lot of unintended consequences, not the least of which is, a lot of classroom time gets taken up for test prep. There’s a very, very long debate to be had, and both sides of that debate or many sides of that debate have important points to be made, but I think at the end of the day, we should all be playing the long game. It sometimes takes away from the work we’re really here to do, which is real meaningful instruction and focus on the arts and many other factors of schooling. Do you think under ESSA (the Every Student Succeeds Act) we may see more of a trend toward more portfolio-style and alternate assessment? I have never been a believer that federal legislation leads to long-lasting and meaningful change at the local level, just because it’s really hard to do that. There are just so many layers, and a lot can be lost in translation. That’s not to say that good things haven’t come about from various pieces of federal legislation, but I do think that you need people on the ground to be chief messengers and to build relationships and to really meet families where they are. One element of our work here that I think is really important to call out is, we built neighborhood schools. While some people may call it portfolio, what we’ve actually done is revitalize existing traditional public schools as neighborhood charter schools. It’s not like choice for the sake of choice. We’ve asked KIPP, Uncommon, and Mastery to meet their neighborhoods where they are and just to be neighborhood schools with the autonomy of a charter. That’s unique to Camden, because public safety is still a challenge here. Go Deeper: See previous interviews, including former U.S. Department of Education secretary Arne Duncan, Teacher of the Year finalist Nate Bowling, and two Texas middle schoolers who seek an end to gun violence. The full 74 Interview archive is right here.